Following my email copy critique, I decided to review corporate web copy. Thanks to a tweet from Jonathan Norris, web editor of Freelance Advisor, I discovered the perfect website to critique. Let’s begin! I’m going to refer to this company as CRPZ Ltd. That’s not their real name, but their actual name is another meaningless acronym, one that offers no clues about what they do. 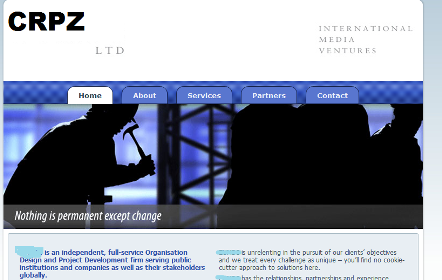 Their company name is supported by a mysterious tagline, ‘International Media Ventures’. ‘Ventures’ makes me think of venture capitalists – people who invest in businesses. So do they invest in media projects? The main image is of construction workers in sillouette. So the image doesn’t make any sense in relation to the tagline. And a caption, ‘Nothing is permanent except change’ only adds to the mystery. But that’s okay. Let’s read some copy and make sense of this business! CRPZ Ltd is an independent, full-service Organisation Design and Project Development firm serving public institutions and companies as well as their stakeholders globally. So CRPZ Ltd design organisations? Interesting. And they develop projects. I wonder if CRPZ Ltd specialise in an industry. Oh yes – media! So they must design media businesses and develop media projects. Okay – I feel like a detective but perhaps we’re getting somewhere. Clients have since 2002 relied on a wide range of growth capabilities and resources as well as innovative management strategies. This is badly written, but I can assume they mean that clients go nuts over CRPZ’s ‘growth capabilities’ and ‘innovative management strategies’. I honestly don’t know what all this means, but it sounds like CRPZ have made the very common mistake of airing their internal workings and presenting them as benefits. Having innnovative management strategies is just wonderful, but it only matters to your clients if there is a direct benefit to them. And ‘growth capabilities’ is supremely vague. If you can help me grow my business, tell me how! CRPZ is unrelenting in the pursuit of our clients’ objectives and we treat every challenge as unique – you’ll find no cookie-cutter approach to solutions here. I like the idea of them being unrelenting, but in what will they not relent? You’d think it was some kind of secret thing that they don’t want to talk about. Why so coy? Just tell me what you do! CRPZ has the relationships, partnerships and experience required to fully support public institutions and companies – we seek to leverage our network and impressive track record of solutions to help you achieve your objectives. I’m disappointed (and pained by) the density of management-speak (‘leverage’, ‘solutions’), and still clueless about what they do. Our track record covers the spectrum across many industries. What spectrum? Which industries? How can I engage with this when I know nothing about it? What are they trying to hide? We usually begin with the end in mind – aligning all components of an enterprise with the operating context to achieve successful outcomes. Desperately lacking details. No evidence of actual work being done by this company, so it’s impossible to be interested in it. Establishing leading edge and truly international communications capabilities we do particularly well. A slightly Yoda-like flourish at the end, but still no clear picture of what they do. How many meaningless words can you put in a row before you absolutely must insert something factual? CRPZ maintains associated offices in Washington DC, Kabul and Karachi. Interesting. Offices in USA, Afghanistan and Pakistan. Still no clues about what the people in those offices actually do, but I’m glad the office locations are not as secret as their services (or products!). To be generous to the business that owns this website, we could argue that what seems to be meaningless jargon might actually be perfectly obvious to the right people (such as their ideal client). But I believe that every website’s home page should be clear to all – even to the uninitiated. All of the problems with this copy stem from a lack of clarity. An over-reliance on smart-sounding but materially vacant business-speak leaves the copy with little meat. It’s a big cream-puff of nothing that leaves you feeling cheated. Jargon and words that sound clever are appealing to a certain breed of business person – probably because they believe that big words connote big things. It’s a copywriter’s job to help these people see the light. Hi Leif, there are some great examples in there of how not to write copy. The opening paragraph would be enough to get me to look elsewhere. It would be interesting to know what the bounce rate is for their home page. I see that the website in question has not changed in the 2 years since your critique! Ha – yes! Good detective work. Their website still needs work.